The Bay View (2 bedrooms) is a large apartment on the ground floor, with panoramic sea views. Pet Friendly. a private rear courtyard for catching the afternoon sun. The impressive living room has views over the garden to the bay, TV with range of channels (Sky Sports, Movies etc) For families with young children please consider that the living room is across the shared hallway. Bay View is a firm favourite with our guests, who love to return year after year. Bay View is proud to be pet friendly! (£25/week). Click below for more details. 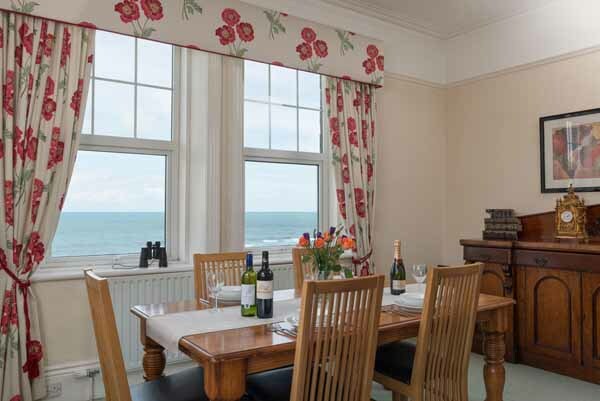 The Lookout Apartment (2 bedrooms) is on the first floor, with panoramic sea views - hence the name! The huge lounge has fabulous views over the bay from large picture windows, as has the impressive master bedroom (king size bed, crisp cotton bedding, goose down quilt) and the twin bedroom. Enjoy eating dinner watching the waves dance over historic Browns Bay. The fabulous 'Lookout' is light and spacious with masses of character including crystal chandaliers, marble fireplace,and grandfather clock. 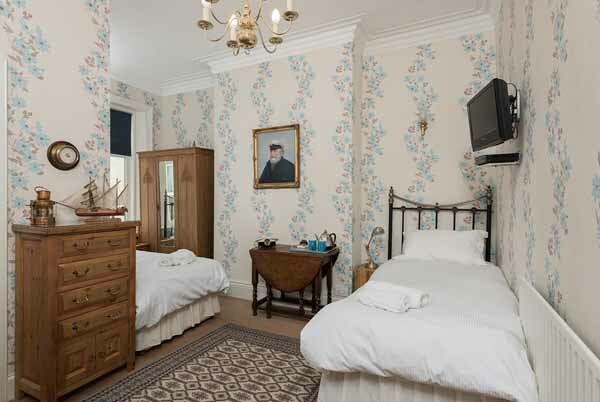 For cosy nights in there is a 40" TV with lots of channels including Sky Sports & Movies, free high speed WiFi to stay connected, a fully equipped kitchen with dishwasher, washing machine, bathroom with bath and over bath shower. Live the High Life! The Priory Penthouse is a light and airy apartment on the 2nd floor with 3 bedrooms. The master bedroom has lovely sea views. There's a king size bed with crisp cotton bedding and hungarian goose down quilt. 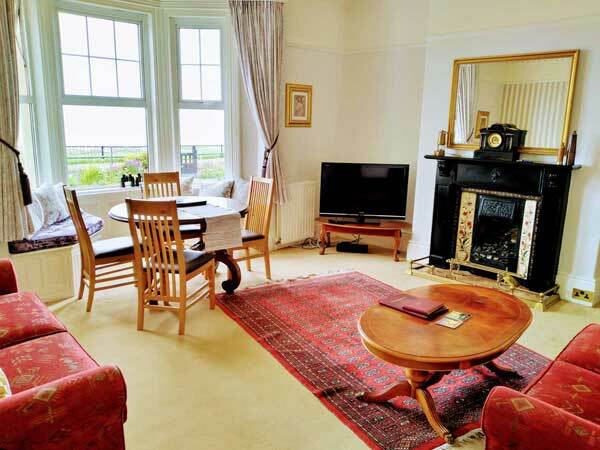 There is a single bedroom, and a charming twin bedroom with views across the coast. 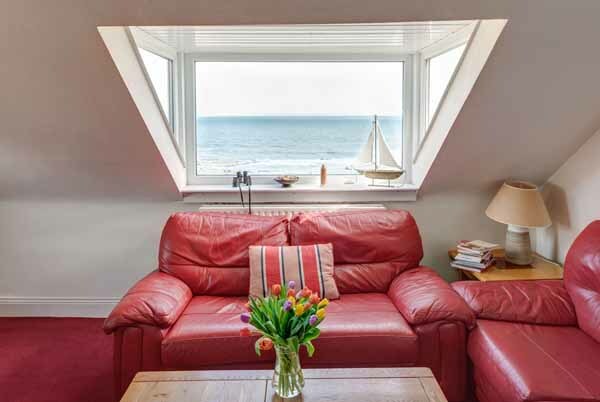 Enjoy the outstanding coastal panorama from the 6 foot walk in window - (binoculars provided for browsing ships on the high seas!). 40" TV with sky sports & movies, free high speed WiFi, fully equipped kitchen, bathroom with lovely walk in shower. With character sloping ceilings providing a unique charm, and is a firm favourite with corporate guests, couples and families with young children. The Captain’s Cabin (sleeps 2) is a spacious studio room with two single beds, sofa, dining table, TV/WiFi, microwave, kettle, fridge, and ensuite with walk in shower. Flexible booking (minimum 3 nights) or Sat-Sat £250. Or if you need extra sleeping space add The Captain's Cabin to your apartment booking for just £150 per week. Just a little mention - although the Captain's Cabin does not have sea views - they are available right outside your front door!